How to keep mental health records and do electronic billing without spending a dime! The webinar presents an in-depth, step-by-step approach to using a no-cost personal computer solution to keep patient information and conduct electronic billing, as well as create an external backup, all within a HIPAA compliant environment. 3. Install and create a backup on an external hard drive. Once your payment has processed, we will send the link and templates to you in your confirmation email. When do I have to start using the ICD-10? How does DSM-5 and ICD-10 correlate with each other? Are you, or your biller, prepared? Have you been given a list of diagnosis codes no longer available? Do you know which codes are no longer valid in ICD-10? A "cheat sheet" and other materials are included. After you order is processed, you will receive a confirmation email with the link to the recording, as well as the PowerPoint slides, and other handouts. This webinar will provide an overview of legal and ethical issues as they relate to psychological supervision and consultation with mental health professionals. Topics include definitions; levels of legal regulation; theories of legal liability in supervision; negligent supervision and its consequences; negligent administration in group practice and organizational settings; special topics; and supervision of non-psychologists. Case examples are considered. Q & A. You will receive a link to the webinar in your confirmation email. This course is designed as a refresher on the legal/ethical issues that every practitioner should consider at least on a yearly basis. Continued risk analysis is an important component of compliance with many legal and ethical requirements including HIPAA. This workshop includes the legal and ethical aspects of compliance. Topics covered include the latest information on confidentiality issues and health information exchanges in the new integrated care world, pros and cons of electronic medical records systems, ethical and clinical issues associated with digital communication, staying HIPAA compliant and avoiding complaints/fines, as well as the new HIPAA rules. The speakers provide a quick review of Medicare Opt-out, discuss provider monitoring and avoiding audits, supervision requirements, issues with distance practice and telehealth, and professional wills. Included with the recorded CDs are source materials including several HIPAA forms, 6 PowerPoint presentation slide decks, electronic communications and social media policies, creating a Facebook page, How To Close Your Practice worksheet, a sample of a professional will, Telepsychology guidelines, and many more! Please note: the CD will be mailed to you and the source materials will be accessible through a link embedded in your confirmation email. 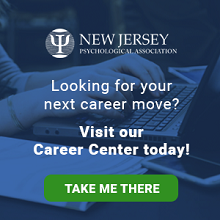 Looking to become a licensed psychologist in NJ? Are you a seasoned psychologist or supervisor who needs a refresher on current regulations and laws in NJ? Hosted by NJPA member James Wulach, PhD, JD, this 2-hour WEBINAR reviews the major laws and regulations governing psychologists in New Jersey that are anticipated to be the focus of the exam. Topics include Confidentiality, Licensing, Record Keeping, Dual Relationships, Advertising, Forms of Practice, Custody Evaluations, Peer Review Law, and more. Order the recorded PowerPoint presentation today! Important Note: Slide 52 has been reworded. In the first bullet point on the slide, please note that only 1 year of supervision needs to be completed after receiving your doctoral degree. The recorded version DOES NOT have this modification. Once we receive your payment, a link will be sent to you to access the recording. Thank you!